Patented with a success rate of over 87% using light indicators and 98% when compared with the symptoms chart. Recommended by the Spanish Association of Midwives. Clinically tested in Spain, Mexico and Korea. Silver medal in the 8th Galactica 2001 International Trade Fair of Inventions. Featured on NBC, FOX, Discovery Channel. 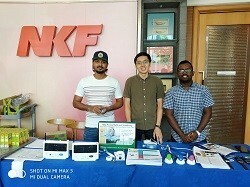 The award-winning WhyCry® Baby Cry Analyzer is an electronic monitor capable of identifying the reasons why a baby is crying. 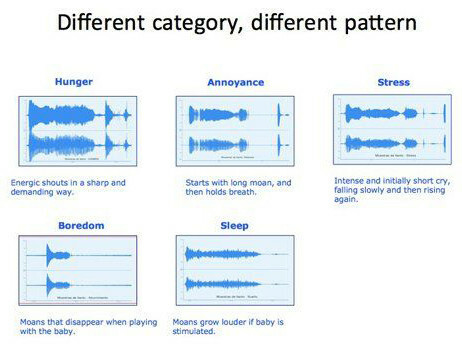 This sound sensitive device is programmed to recognize different pitches and then digitally analyze and transmit the baby’s cry into one of five simple expressions: hungry, bored, annoyed, sleepy or stressed. An essential tool to ensure a calm, happy baby and confident, relaxed parents! 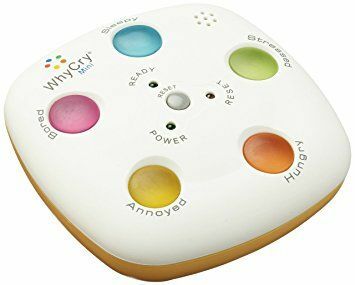 The WhyCry® Baby Analyzer does not aim to replace a parent or caregivers natural ability to understand their baby’s needs, but to offer guidance in recognizing the messages that our babies convey to us. 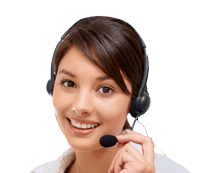 The analyzer is NOT a medical instrument, and if a parent is in any doubt about their baby’s health, they should contact their doctor. 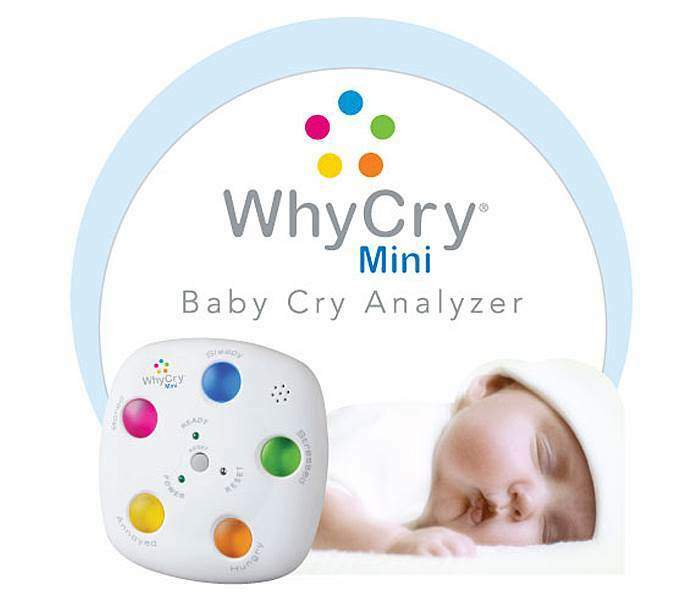 The WhyCry® monitor is a baby cry analyzer. The monitor listens to the baby’s crying for 20 seconds then digitally analyses it before indicating why. The device then illuminates one of five crying ‘expressions’ telling you whether the child is hungry, bored, tired, stressed or annoyed. WhyCry® has been clinically tested in Europe, with a success rate of 98% when used in conjunction with the accompanying symptoms chart. An ideal nursery aid for parents, child minders, nannies and carers of young babies. 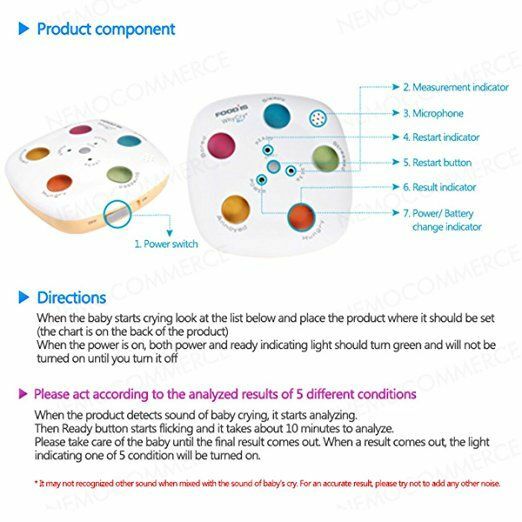 The unit works by analysing the baby’s crying power, frequencies of cry, intervals between crying, and associates the baby’s cry with an established pattern programmed into the unit. After a 20 second period of analysis it shows the result in a clear and precise way by illuminating one of 5 simple facial expressions: hunger, boredom, discomfort, sleepiness and stress. The baby will be understood and attended to. Parents will have more time to enjoy their baby. The learning and understanding process of the baby will be speeded up. Other child-minders will be able to attend to the baby correctly. 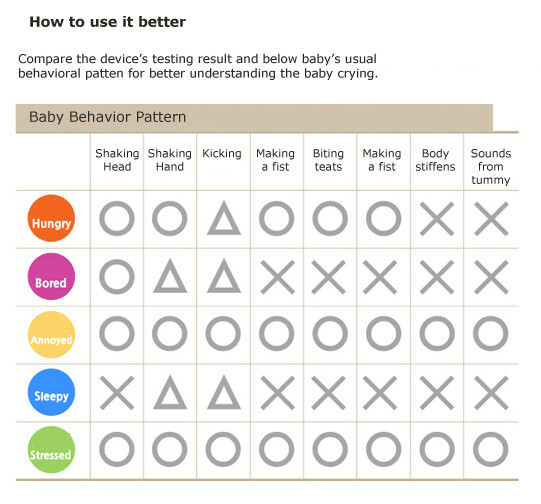 Advanced frequency analysis technology analyzes a baby’s cry within 20 seconds at the touch of a button. Allows parents and caregivers to fully comprehend their baby’s cries and thus, effectively attend to the child’s immediate concerns, wants and needs. Applies to a multitude of situations and lifestyles, from first time parents to baby sitters and other caregivers. Brightly colored indicator lights light up the baby face icons that correspond to the baby’s needs. 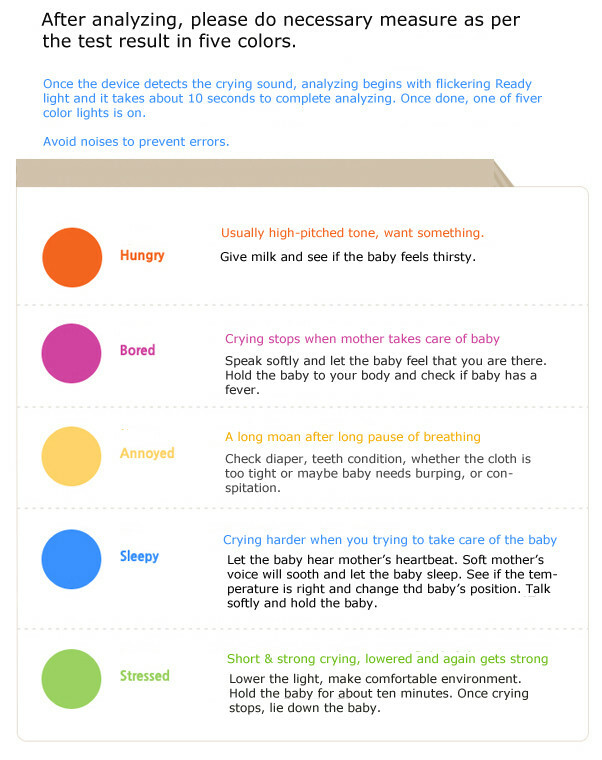 Easy to use interpretation notes and easily read indicator icons provide detailed descriptions of the baby’s emotional or physiological state and offer care suggestions. 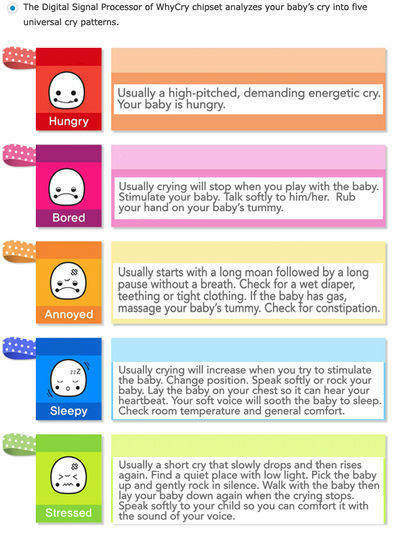 A book called: “Understanding your baby will stimulate its development”. Velcro adjustable strap, easily attaches to cribs, strollers, etc. Portable, can be easily carried around or attached to a belt.